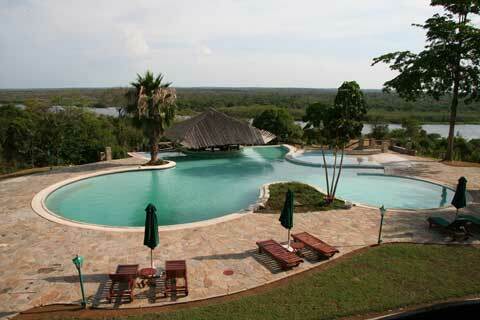 Established in 1954, Paraa Safari Lodge is in Murchison Falls National Park. The lodge is located in the north west of Uganda over looking one of nature’s best kept secrets, the River Nile, on its journey from its source at Lake Victoria to join Lake Albert – here it is suddenly channeled into a gorge only six meters wide, and cascades 43 meters below. The earth literally trembles at Murchison Falls – one of the world’s most powerful flows of natural water. Paraa Safari Lodge offers a unique blend of comfort, relaxation and adventure. Each of the rooms is a haven of style and serenity, complete with balcony and private bathroom. The safari décor of the lodge still reflects the bygone era of early explorers, enshrined with a modern touch. The luxurious pool overlooks the winding River Nile below, which was the setting for the classic Hollywood movie “The African Queen” (starring Katharine Hepburn and Humphrey Bogart). Enjoy a variety of excursions and activities; from exhilarating Safari drives to boat trips along the River Nile, ending at the foot of Murchison Falls. For the more adventurous, one can trek up to the top of the falls and marvel at the views through the mist. A variety of ecosystems and an impressive 451 species of birds awaits you here.